It's midterm election season and forever First Lady Michelle Obama is doing her part to get people out to the polls to vote! 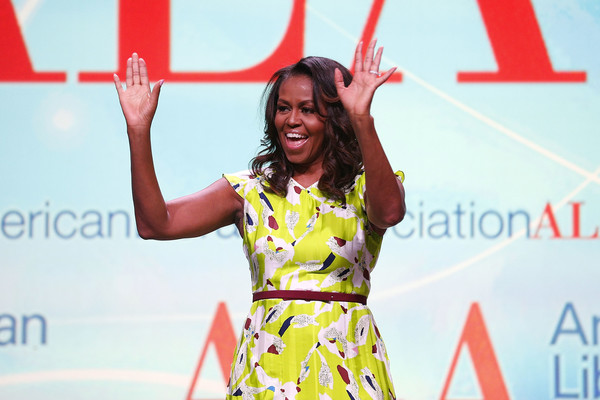 The former First Lady will be hitting the road to encourage potential voters to show up and show out at the midterm elections. The When We All Vote Week of Action will be held Sept. 22nd-29th. 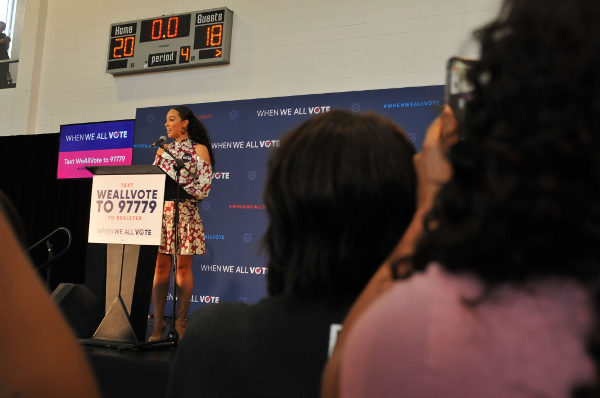 FLOTUS,will host events through her new initiative, When We All Vote - a nonpartisan organization she launched in July, all across the country to register voters and to get them excited about the November midterm elections, raise awareness on issues and civic participation. An array of celebrities will be joining her on her journey. Mrs. O, who serves as co-chair, has teamed up with nearly 20 black organizations - including nine predominantly black fraternities and sororities - that will hold events in their own communities. The National Urban League, the NAACP, Black Girls Vote, Delta Sigma Theta Sorority, Alpha Phi Alpha Fraternity and others have signed on to show support. Democrats are working overtime to take back control of Congress from the Republicans. Mrs. Obama's week-long action to get people signed up coincides with the 53rd anniversary of the Voting Rights Act, which gave African-Americans the right to cast a vote. "With so much at stake in our country, sitting on the sidelines isn't an option," Mrs. Obama said in an email. Celebrities such as Chris Paul, Janelle Monae, Shonda Rhimes and more will headline events in major cities like Atlanta, New York, Los Angeles, and Chicago. 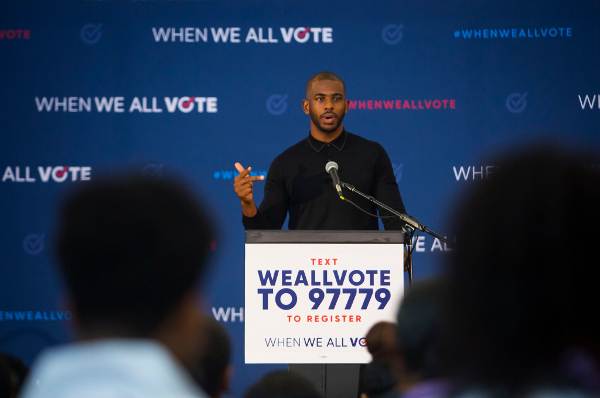 On Saturday, Houston Rockets player/When We All Vote co-chair Chris Paul and CNN's Angela Rye (both, above) spoke to hundreds of people at the Houston Texas YMCA about the power of their vote and fired up the crowd with a call to action. Thank you to our volunteers across the country, who helped us kick-off the #WhenWeAllVote Week of Action by attending an event, or creating their own, and getting voters registered! Together, we can shape the conversation around voting in our communities. . Text WeAllVote to 97779 to register to vote. FLOTUS is scheduled to speak at one of the first events in Las Vegas today (September 23rd). FLOTUS will launch her tour for her candid memoir, "Becoming: An Intimate Conversation with Michelle Obama." Due to overwhelming demand, Live Nation and the Crown Publishing Group, announced second shows will be added in Washington D.C. (November 25th) and Brooklyn (December 19th). Nice! 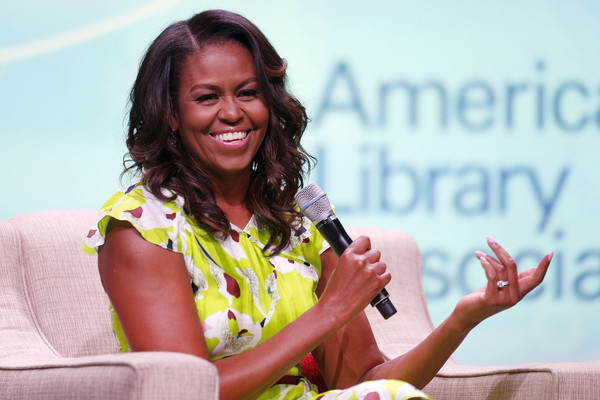 The U.S. book tour will kick off in Michelle's hometown of Chicago on November 13th and it will feature intimate and honest conversations between Mrs. Obama and a selection of to-be-announced moderators, reflective of the extraordinary stories shared in the wide-ranging chapters of her deeply personal book. Tickets for the book are currently on sale here: BecomingMichelleObama.com. And the tickets - if you can get your hands on them - are STEEP. The book is currently available for pre-order and will be released the same day the book tour begins, November 13th. Cop those tickets because they're selling fast! FLOTUS teamed up with several celebs for an inspiration video clip to remind students that nothing should stand in their way of going to college. Kelly Rowland, Ciara, Nick Cannon, Jussie Smollett and more are featured in the clip where they encourage all students looking to take charge of their future by completing their education past high school. The video encourages students to participate in an online community and celebrate their own achievements. Students can sign the pledge and join the movement here. Get into the #ReachHigher #BetterMakeRoom realness above. Michelle Obama can now add marriage officiant to her resume. The Chi-town native did the honors in her hometown for couple Stephanie Rivkin and Joel Sircus as they said their "I Dos" at the Theater on the Lake yesterday (September 22nd). The bride's father is the Deputy Mayor of Chicago, Robert S. Rivkin, so you already knw this was a hometown favor. Lucky couple. Watch Mrs. O do her thing above.